William Joseph Thibodeaux is a native of Rayne, Louisiana. He was one of five children—three boys and two girls born to Wilson Thibodeaux and the former Rose Mae Menard of Mire. He grew up in a French-speaking community, and like most Acadians during that era, French was his first language. Thibodeaux failed in the first grade because he could not speak English. He attended Rayne High School and at the age of 18 enlisted in the U.S. Navy during the Vietnam conflict. He served on board the U.S.S. O’Bannon (DD-450), a World War II era destroyer. It was one of the two most decorated navy ships of all World War II vessels, which he is most proud of. This was where he got his love of history—through books while in the Navy. Thibodeaux is married to the love of his life—the former Judy Clark of Riceville, La. After serving his country Thibodeaux hired on with a Fortune 500 company—Southern Pacific Railroad and later Union Pacific Railroad, where he was employed for 44 wonderful years. He was fortunate to have spent his entire career working for the railroad between Houston and New Orleans. This was where he got his passion for history. One of his many chores as Roadmaster with the railroad was making twice monthly inspection trips of the railroad property by train on his assigned territory. This gave him a perfect opportunity to view the railroad while hear interesting stories. This is where he heard many stories and met some of the nicest people. 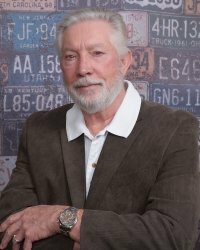 After retiring, Thibodeaux began writing stories that he had heard earlier in life. Some stories go all the way back to his early childhood. For the last decade or so, Thibodeaux has led a French table group in Rayne (la table Française de Rayne et histoire) every Saturday morning beginning at 9:30. Each week he selects and compiles a list of about 30 Cajun French words and phrases that he sends to recipients. He occasionally has invited guest who share their stories. Each session is audio-video recorded and archived at Dupré Library for posterity. And, for more than three years now, Thibodeaux has conducted a monthly history talk at Hospice of Acadiana in Lafayette. The stories he shares all have historical significance to the Acadiana region. His talks are about people, places and events of long ago. They are also audio-video recorded and archived at Dupré Library. The talks are mostly from information he has researched or written about. Thibodeaux will soon be a published author. He is nearly finished assembling a book and it should be released sometime around May or June 2019. His book is titled: Hidden History of Acadiana. It is a compilation of non-fictional short stories that he has written over the years about people, places and events of long, long ago.